The early 1950's was a period of rapid evolution for Hamilton. The established traditions of three decades of premier watchmaking began to blend together with new advances. For example, automatic movements were introduced in the early 1950's. Calendar models were also introduced. Spring loaded shock jewels were added to protect delicate balance staffs. To trim costs, Hamilton introduced stainless steel case backs, and rolled gold plated bezels. Dials with embossed figures were added. To cap it all off, watches started to be designed with gasketed cases and advertised as "waterproof". All of that happened within the span of three years. 19th century century Cardinal, Blessed John Henry Newman said, "To live is to change and to be perfect is to have changed often". So one might say that Hamilton was on the path to perfection. Despite all of the new advances, some of the "old ways" held fast - especially for Hamilton's higher end watches. 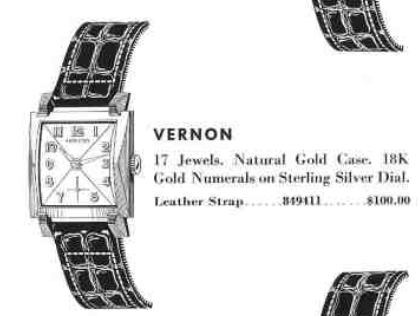 Take for example, the 1954 Vernon. It was produced for two years. The Vernon came in a 10K solid gold case with a two-tone sterling silver dial with solid 18K gold numerals. The two tones of the dial are the result of a brushed finish with the direction of the brush marks going in different directions. The result is the tone of the dial changes, depending upon the direction you look at it, just like the stripes of a freshly mowed lawn depends on the direction in which it was mowed. Behind the dial you will likely find an 8/0 sized, 17 jewel, American-made 747 movement. Because the Vernon was also made in 1955, you might also find the 747's replacement, the shock jeweled 730 movement. I recently picked up a Vernon project watch. The dramatic difference in the tone of the dial made me wonder if it was the result of actually coloring the dial. As received, it was in nice shape, obviously well used but no obvious distractions or areas of concern. The back is nicely engraved with "In recognition of Faithful Service". There is no name and no date so I wondered if perhaps that information was polished off. A close observation of the case back shows no signs at all of being heavily polished or additional engraving. The topic of engravings is often debated by collectors... the question being, "what is the impact of an engraving on a watch's value". Obviously the answer depends on several factors, including personal subjectivity. It's a common concern, as you will sometimes see watches for sale where the engraving was removed by polishing the case back (and removing material) until the engraving disappears or, instead, covering it up with additional, more decorative, engraving. The general consensus is, however, as long as the engraving is well done the impact on value is minimal - it could even add to the watches value if there's a n established provenance behind it. It's also unanimous that removing engraving damages the watch and detracts from the value. So the moral of the story is the impact of personalized engravings are a matter of individual preference but removing them is not advisable. Without the crystal and bezel in place, you can see the brushed finish on the dial. By all appearances, this dial is original and looks great, but if it was in bad shape, it could be redone to look like new. The 747 movement is in fine shape with a slight haze over the bright nickel finish - a good indicator that it hasn't been overhauled very recently. Other than a 2006 service mark, I don't see any other watchmaker's marks inside the 10K gold case back. You really have to appreciate how solid gold cases never show any green verdigris. Everything is thoroughly cleaned, dried and ready to be reassembled with fresh lubrication. A trip to the timer reveals that the watch is running well. The beat error of 2ms could be lowered if I removed the balance and tinkered with the hairspring but it's risky business and it's not high enough to really be a performance issue. The risks of screwing it up are greater than the benefit of lowering the beat error. The dial and hands go back on and everything gets tucked safely back inside the case. A period correct, new old stock strap completes the restoration. This Vernon is ready for another 60 years of wrist time. Beautiful restoration. I've been lookin at old Hamilton's to potentially buy for my wife and there is one of these for sale currently for $325. Used condition, but overall looks inpretty good condition. Do you think this is a good price? And what would a restoration like the one above cost? I'm new to the vintage watch market and just looking for some guidance on pricing. Thank you!